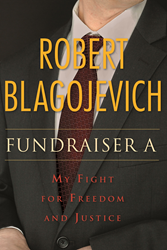 Northern Illinois University Press is pleased to announce "Fundraiser A: My Fight for Freedom and Justice" by Robert Blagojevich has been recognized as a finalist in the 18th annual Foreword Reviews' INDIEFAB Book of the Year Awards. A testament to the human will to struggle against overwhelming odds to right a wrong. "Fundraiser A" is a thought provoking story told from an "inside the Courtroom" perspective. It is a criminal defendant’s gripping account of how he rose to the biggest challenge of his life and beat the odds of a 96 percent Department of Justice conviction rate to walk away with his freedom. It offers readers not only a previously untold story of a fascinating trial with well-known, colorful characters that captured the attention of the nation, but also a look at a universal relationship—brothers—as well as the theme of a David ordinary citizen facing the Goliath federal government. This book is a testament to the human will to struggle against overwhelming odds to right a wrong. "Fundraiser A" reveals the strength and courage of an innocent man determined to prevail, how he managed to get by and survive being wrongly prosecuted, and ultimately sounds a warning bell to the rest of America's citizens that they must continue to protect their civil liberties and hold their public officials accountable. "The 2015 INDIEFAB finalist selection process is as inspiring as it is rigorous," says Victoria Sutherland, publisher of Foreword Reviews. "The strength of this list of finalists is further proof that small, independent publishers are taking their rightful place as the new driving force of the entire publishing industry." Foreword Reviews will celebrate the winners during a program at the American Library Association Annual Conference in Orlando, Florida, in June. They will also name the Editor's Choice Prize 2015 for Fiction, Nonfiction and Foreword Reviews' 2015 INDIEFAB Publisher of the Year Award during the presentation. Books are available online and bookstores everywhere. Robert Blagojevich was born and raised in Chicago and received his MA in Eastern European studies and economics. After leaving active duty with the US Army, he continued in the US Army Reserves while working in the financial services industry. Robert is currently a small business owner in Nashville, Tennessee.